The Small-Tree 4-Port Intel PCI Express Gigabit Ethernet Network Adapter P2EG-4-T allows you to expand the network connectivity of your Intel Mac systems. The P2EG-4-T provides the ability to significantly increase the network bandwidth of your system, enabling you to support larger projects effortlessly. 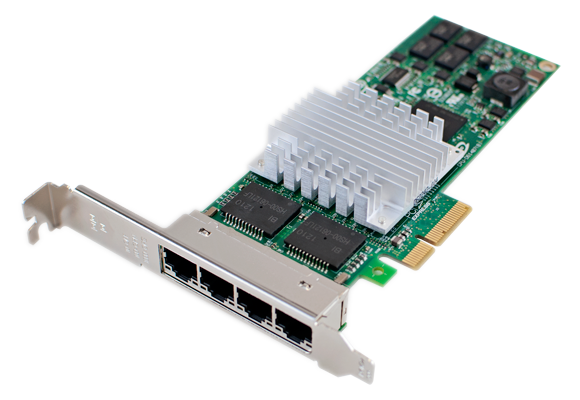 The P2EG-4-T card supports jumbo frames, flow control and VLAN features which provide further improvements in performance with low CPU utilization. The P2EG-4-T Gigabit Ethernet ports will support Mac OS X's built-in link aggregation software in combination with the internal Gigabit Ethernet ports of the system. The P2EG-4-T will transparently load balance among all linked Gigabit Ethernet the ports and seamlessly fail over if one or more ports or cables become disabled. Must be using OS X 10.7 or later. PCI Express Supports Apple Mac Pro with PCI Express and Intel Xserve systems.